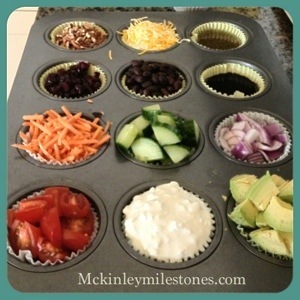 Try making a salad bar out of your muffin tin! Use foil and save for side salads with your meals throughout the week. This is awesome for menu planning for the week! Quick, easy, and a great way to let children choose. That’s a great idea! I’m a big salad person but I never thought of that :). Thanks for Sharing! No problem Hannah! I’m a salad fan as well. 🙂 Thanks for stopping by!! That’s a great idea for kids. Good for fruit salad too I bet. Oo yes!! I’ll have to try that too!